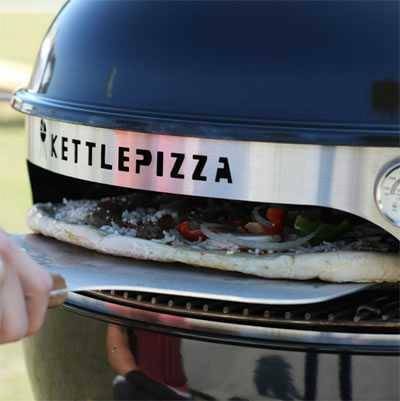 KettlePizza transforms kettle grills into high heat pizza ovens. 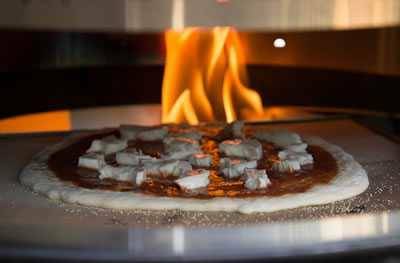 The KettlePizza pizza oven insert is another one of those gadgets that got me all excited when I first heard about it. They make several kits ranging from $116 to $475 and there are 18.5" and a 25.5" models. They sent me their top of the line to test: The Serious Eats KettlePizza Special Edition Kit with the Prograte, Tombstone, Baking Steel, Wood, and Aluminum Peels and a 10% Donation to Charity. KettlePizza is a well made stainless steel ring that sits between the lid and base of your Weber Kettle, and a pizza stone. There is a big opening in the ring so you can slide your pizza in and out, just like a real wood burning pizza oven. The Special Edition has a tombstone shaped stone that sits in its own ring and is flush with the front of the kettle under the opening. There is space on the sides, and rear, and a pocket in the rear to hold wood chunks or small logs. Above the pizza is a heavy steel reflector. The idea is that the hot logs create flame that licks along the metal plate above the pie creating an environment similar to a real stone pizza oven. The problem with grilling pizzas in general is that the bottoms tend to burn before the tops cook so this arrangement is designed to solve that problem. In theory it sounds ideal, and it looks really cool! I'll let Chef Ryan Udvett, our test kitchen director have the final word "This is a case of good intentions, great design research, and passion for pizza coming together and adding up to less then the sum of its parts. It just doesn't outperform a plain old kettle with a stone if you set it up properly. Then there is the price tag and the cost of fuel since it requires both charcoal and hard wood to function. And lastly it is a specialty device, a uni-tasker that needs a lot of storage space."